Lately I have found myself more and more interested in the early days of Saab. The two-stroke engine, the tear drop design and the whole early history of Saab. So lately I have been searching for reviews of the early cars and other interesting and enjoyable writings about the early years. Last week I came across a little summary on how Saab came to the US. It's short, but very enjoyable for someone who is starved of information like me. You should check it out at morningsun.net. As mentioned, I have also searched for read tests of the early Saab. And I've found a few. Reproduced below is a 1962 British road test of the Saab 96. 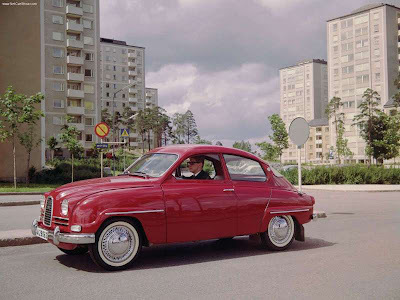 There is not doubt that the early Saabs were very unique back in the 1950s and 1960s with its aerodynamic design, two-stroke engine, freewheel, front wheel drive and coil spring and telescopic dampers on all four wheels. BY JOHN B. BALL – ILLUSTRATED BRISTOL NEWS 1962. THE SAAB 96 is a car which has been proved and is being sold almost as a result of the car’s tremendous rally successes over the past two years. Any car that can win the Monte Carlo Rally must be a very fine performer, but when a car with an engine capacity of something less than a British Mini can do this and outstrip cars of four or five times its capacity, then it must be a phenomenal vehicle. It is very difficult to liken the Saab 96 to any other car on the road. To be brief, it is a three cylinder two-stroke engine, with a front wheel drive. It is manufactured in Sweden by the Saab Company, who, of course, are world famous aircraft manufacturers. When studying the overall design of the Saab, it is not difficult to see that much of the company’s experience in the aircraft field has been successfully introduced into the design of this car. The line has to grow on one, but after a very short time it invariably does, and whether one likes it or not one has to admit that it is extremely aerodynamically styled, rising in a gentle sweep from the front, and falling to a gentle curve from the roof line directly down to the rear bumper. Upon further study, one cannot help but be impressed by the sturdiness of the body of the Saab. The thickness of the metal is greater than any car made in Great Britain at the present time, and the vehicle has an aura of being built to last. This is,of course, no doubt on account of the fact that if a car can stand up to Swedish road and weather conditions, it is pretty well equipped for use in all parts of the world. It is easy to get into the Saab. The large doors open to a maximum width, giving complete accessibility. Once seated one studies the interior of the car. The trim and seating is adequate, sturdy and certainly not ostentatious. The dashboard facia is simple but completely functional. The main instruments are grouped together immediately in front of the driver, with the ancillary controls immediately by his left hand. Whilst on the subject of controls, I would like to pay tribute to the car’s heating and ventilating system, this is extremely good, even if the booster motor is exceptionally noisy. The Saab tested was fitted with a three-speed gearbox, and I must say, to my mind, this is certainly the worst thing about the car. The column change cannot be faulted to any large extent, for it is quick and decisive in its control. My main criticism with the Saab box is in its gear ratios. The first gear is only capable of moving the car up to approximately 14 m.p.h. This could be fair enough if you had four gears, but, to my mind, it is certainly not enough with a three-speed gearbox. A more serious point, however, I would say is the fact that the second gear can only take you up to 46 m.p.h., before the engine begins to scream. This means that even at this very modest speed one has to put the car into top gear, which must obviously adversely affect its acceleration and general performance figures. For all this, however, I must say that quite reasonable acceleration times can be achieved and on the test 0-50 m.p.h. was obtained in as little as 16 seconds. The top speed on the test was 83 m.p.h. The car took some considerable time to build up to this speed, but is at its happiest when moving along at a good pace in top gear. Cruising speed in the Saab could be said to be from 65-75 m.p.h., and the car could certainly maintain this type of average for long periods without any strain or effort, as has been well proved. Petrol consumption on the Saab could vary tremendously according to the driver. However, a rough estimate would be between 28 and 34 m.p.g., although this can be greatly affected by a small and unusual gadget known as the free wheel. I found that the car was rather easier to drive with this applied rather than in the normal fashion, for when lifting one’s toe from the accelerator, a three cylinder engine is rather inclined to pull the car down quicker than is comfortable. However, there is a snag to the free wheel, and that is, of course, that one has little control over the engine when stopping, and the whole mechanics of pulling up the car must be placed firmly on the shoulders of the brakes. One of the most likeable assets the Saab possesses is its stability on the road and ability to go round corners at high speeds. This is no doubt entirely due to the suspension which is of the coil type on all four wheels. Being a front wheel drive, a certain technique must most certainly be developed when cornering quickly, but Carlsson, the driver of the Saab that won this year’s Monte Carlo Rally, has more than proved that this is possible. To sum up the Saab, it is not going to be everyone’s cup of tea. It comes in a class completely of its own, and is a four or five seater family saloon. It will possibly appeal to the man who wants comfort for his family and who can still get pleasure from the car’s performance. It is a car that will need very little maintenance, and should last for a long time, being very well finished indeed. Specification Engine: 3 cylinder, 2 stroke Capacity: 841 c.c. Body: Length 13’ 2” Width: 5’ 1” Price: £826 including tax.